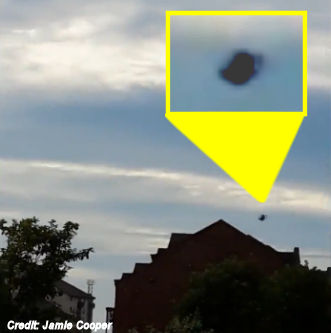 UFO Video-Taped Over Scottish Town? Jamie Cooper, 33, claims that the unidentified object was spotted by his 13-year-old son James hanging over Ayr Harbour for around 15 minutes at 5.30pm on Sunday. In the shaky 28-second clip a black entity, which resembles a chinook helicopter, is clearly seen hovering in the distance.